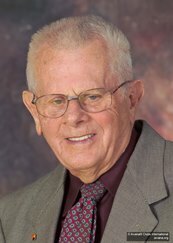 STREAMWOOD, Ill., Jan. 8, 2018 /Christian Newswire/ -- Arthur Reynold Rorheim, co-founder of Awana and one of the pioneers in children's ministry, passed away on Friday, Jan. 5, 2018. He was 99. The Lord used Rorheim to develop and grow the children's and youth ministry from a club at a church in Chicago to a global organization. Today, Awana has an outreach of more than 3.7 million children in more than 100 countries. Rorheim, who served as executive director, president and president emeritus of Awana, still regularly visited Awana headquarters in his late 90s. "I've never found the word 'retirement' in the Bible," he joked. "Art Rorheim was a man whose influence for the kingdom of God will have a lasting impact for generations to come," said Valerie Bell, Awana CEO. "Throughout his life he tirelessly proclaimed the gospel and dedicated his life to equipping Christian leaders to share this message with millions of children and moms and dads all over the world. To that end he was relentlessly focused in serving his Savior all the days of his life. His heart and passion for Jesus inspired millions. Awana, and the entire Christian community, will dearly miss this extraordinary man." Rorheim, who spent more than 70 years with Awana, was born May 7, 1918 to Norwegian immigrants who eventually settled in Chicago near the future site of the North Side Gospel Center, the church where Awana would be born. After serving as a volunteer, he went into full-time ministry in 1943 as the youth director of the North Side Gospel Center. At the time, most churches didn't have mid-week programs for children like they do today. In 1950, Rorheim and Pastor Lance "Doc" Latham took the concept beyond their church and founded the Awana Youth Association as a non-profit provider of curriculum and training materials. In the early days, Rorheim shared a desk with another employee in a stairwell at the North Side Gospel Center. Although he never attended college, Rorheim quickly showed his creativity and organizational skills, developing many of the programs that make Awana unique today, including Bible-based handbooks and Awana games competitions. Scripture memorization has long been one of the trademarks of Awana, and Rorheim lived it out in his own life. On one occasion, he even required his children and grandchildren to recite Psalm 1 before attending a family reunion. Friends and co-workers also praised him for his wit and love for children. "He was so much fun, and he saw life as fun," said Jeff Schacherer, who worked closely with Rorheim at Awana and frequently traveled with him. "He loved to play jokes on people. He had a passion for life, and he felt a need to share it with others." "Rorheim had tremendous energy because he had a passion for helping others connect with God," Schacherer said. When they traveled together, Rorheim wanted to sit separately so that he could have the opportunity to share his faith with the person sitting next to him. "He didn't see bodies; he saw souls," Schacherer said. Rorheim took Awana global in 1972 when he started the first international Awana club in Bolivia. He eventually visited some 50 countries to spread the word about Awana, and he continued to travel for the ministry well into his 90s. Rorheim continued to lead the national and international expansion of Awana until retiring as executive director in 1990. He then served as Awana president until 1999 before assuming the role of co-founder/president emeritus. He is survived by his son and daughter-in-law, Ken and Katie; his daughter, Kathlyn Brock; four grandchildren; 10 great grandchildren; and three great-great grandchildren. He is reunited in heaven with his wife, Winnie; his parents, Olaus and Alida; his brothers Roy and Leif Oliver; and his son-in-law Dennis Brock. The memorial service will take place at Quentin Road Bible Baptist Church, 60 Quentin Road, Lake Zurich, IL 60047 at 11 a.m. Saturday, Jan. 27. In lieu of flowers, memorial gifts may be donated to Awana's Rorheim Legacy Fund, account number 1400D.